and delivery... All in single url. Let's get started. Create a URL. Where is your source video? If you have some time on your hands watch this loading screen to learn how we build a universal video url. If not feel free to wait for the email confirmation. Sign Up 800.513.1740 Live Chat Try One Free! The first video platform that puts you in control. Your choice of 3 video players, 2 CDNs and device detection and transcoding from Encoding.com. Cloud Transcoding from Encoding.com 24 rock solid presets for the widest smartphone, tablet, and OTT coverage in the market. Responsive CDN hosted players, automatic upgrades, use a player system wide or mix and match players for each video. sign up for vid.ly today - Try one for free! We take all the guesswork out of encoding profiles to help you address the ever-changing landscape of HTML5 browsers, smartphones, tablets, set-top boxes and connected TVs. Send us any source video and we’ll intelligently transcode it into multiple formats to ensure industry-leading support for all newly released and legacy target platforms. Vid.ly will always keep up with the latest mobile devices and browsers on the market so you don't have to. Your transcoded video content is stored on secure, redundant cloud storage for virtually unlimited scalability and file size support. All video content is cached and delivered from a distributed network of edge servers on your choice of the Akamai or Amazon CloudFront CDN networks for best-in-class video delivery across the globe. Expand your audience using Vid.ly. Vid.ly includes a database of over 6,000 mobile devices, tablets and browsers mapped to multiple formats to ensure successful and optimized playback across iOS, web, Android and other platforms. As a result, Vid.ly provides the widest mobile coverage in the industry. When a user accesses your Vid.ly embed code or short URL, we will instantly detect his device / browser and other unique video requirements to deliver the highest quality playback experience. With the Vid.ly API you can easily plug a powerful, high volume video system directly into your website, application or CMS. Using a single API request, you tell us where the source video is stored (HTTP, FTP, Amazon S3, Cloud Files, Microsoft Azure, or DropBox) and how you want to be notified (email or XML post). We take care of the rest. Sample scripts are available in all popular languages including PHP, Ruby and C Sharp. Vid.ly’s powerful and well-documented API empowers you with features for Automation, HD, Analytics, Security, CSS Customization, and custom encoding outputs. Create individual Vid.ly's quickly and easily using the Encoding.com client interface. 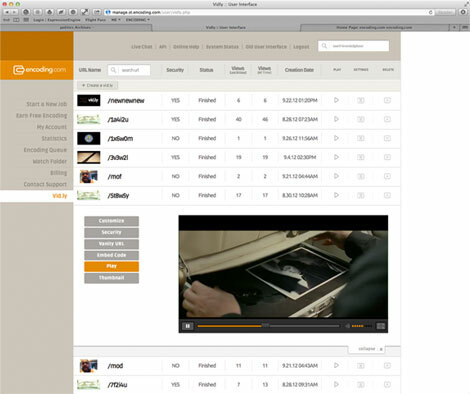 Or, utilize the Encoding.com web-based Watch Folder to create multiple Vid.lys directly from a content library. Access powerful features such as vanity URLs, Security controls, player customization and poster image uploads. And, you can review high-level stats about your Vid.lys including views in the last 30 days and all time views per Vid.ly. Each Vid.ly comes with a unique iFrame embed code that you can publish in your HTML pages or inline within Facebook. When the end user clicks play, we detect the device and browser to stream the correct and optimized video via an HTML5 or Flash fallback video player. Currently, each Vid.ly will generate more than 25 output renditions to ensure playback across thousands of devices. With each Vid.ly, we generate a short URL (ex. Vid.ly/5u4h3e) that’s designed for sharing across Twitter and Facebook. When accessed from a mobile device (app, email client or mobile browser), Vid.ly’s device detection will deliver an optimized video format directly to the device's native video player. You can even replace videos within a short URL – perfect when including Vid.ly URLs in print collateral. Enterprise-grade security features let you protect your video content by limiting the timeframe for a video’s availability and/or limiting the geographical locations or domains from which it can be viewed. Token-based authentication is also available to limit playback and embed to a single domain name. Use Vid.ly QR codes to connect offline brand messaging with powerful and engaging video messages. With each new generated Vid.ly, we will send a 300dpi QR code in the email confirmation or XML response that you can add to print collateral or in-store displays. End-users can simply scan the QR code with mobile devices to instantly launch and play your Vid.ly. When an iOS enabled device accesses your Vid.ly, we will deliver video using Apple’s HLS format. HLS is an adaptive bitrate delivery technology that segments your video into 10s increments and multiple bitrates (300k, 600k, 1200k, etc.). HLS also updates your video to include a 64k Dolby HE AAC audio stream. When delivered to an iOS device, HLS conducts bandwidth detection and selects the ideal bitrate for delivery over a variety of bandwidth levels common to cellular, 3G/4G, and WiFi networks. Vid.ly prepares your video content in two different HLS resolutions to support both the iPhone and iPad. 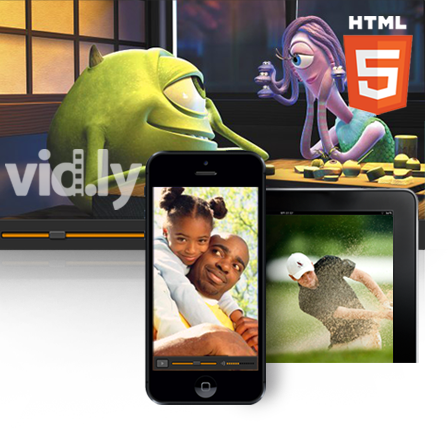 Vid.ly's HTML5 Video player provides a consistent set of player controls integrated with the HTML5 video element <video> to display a unified video experience across all HTML5 browsers. Users with older non-HTML5 browsers are presented with an identical video playback experience using our Flash fallback player. We offer features for customizing your Vid.ly player with a unique look and feel across both the HTML5 and Flash fallback players. Our HTML5 video player includes full-screen support across all compatible browsers, HD on/off controls and volume controls. A significant percentage of desktop, web-based, and mobile email clients will support playing video within the client. Unfortunately, each email client supports a different video specification. Vid.ly offers a new version of our embed code that will enable you to include beautiful inline video within your HTML email campaigns. If the email client does not support video, a poster image with an overlay play button will be presented to drive users to play the Vid.ly in web browsers or mobile native players. The Vid.ly analytics package delivers real-time, detailed browser and mobile device consumption statistics for all your videos. Receive in-depth analysis of your audience with viewership data across 6000 mobile devices and tablets. Vid.ly analytics are available as a web service via our API’s “GetStatistics” function empowering you to customize this data to meet your organization's unique needs. Easily integrate this real-time data into your existing systems and media workflow. Vid.ly analytics data can be pulled from any date interval for a single Vid.ly URL, a group of Vid.ly URLs, or the entire account. Below is a snapshot of the data we return for a mobile device and web view. HTML5 includes the <video> tag allowing direct video playback within the browser. Playing video within the browser eliminates the need (and CPU playback overhead) for third party plugins like Flash or Silverlight. HTML5 video opens up new unique possibilites for creating interactions with within player and other elements of the page (e.g having a inline video advertisement pause the video) Unfortunately each browser that supports HTML5 requires a different video format (Safari-H.264, Firefox- Ogg, Chrome-WEBM) and some browsers like Internet Explorer 8 and earlier don't support HTML5 and require still require Flash video. When using Vid.ly we automatically transcode your source video to all compatible HTML 5 video formats and using device detection will deliver the correct format to the correct browser type. Vid.ly and the vid.ly film strip logo are trademarks of encoding.com. All rights reserved.